This coding sequence is a producer of Lysine descarboxylase (Streptomyces coelicolor) which is an enzyme from the lyase family that converts lysine to cadaverin. The enzyme realizes the carbonyl group of the lysin amino acid. There is cadeverin producing (1,5-diaminopentane), a primary diamine which alkaline environment. The lysine decarboxylase is an enzyme induced the synthesis of which is promoted by anaerobiosis and an acidic pH. In bacteriology, this enzyme is sought through the middle of Moeller lysine or medium lysine Taylor. This enzyme is also the first step in the production of Desferrioxamine B which is a siderophore. The production of the protein has been controled by a PBAD promoter inductible with arabinose (0.01% arabinose added in the culture medium. (ref : Bba10500) The RBS used is the Bba B0034. Investigation of the cadaverine production by the lysine decarboxylase DesA. 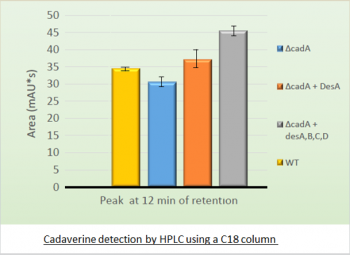 The cadaverin production has been detected by HPLC using C18 column after induction of the des genes. 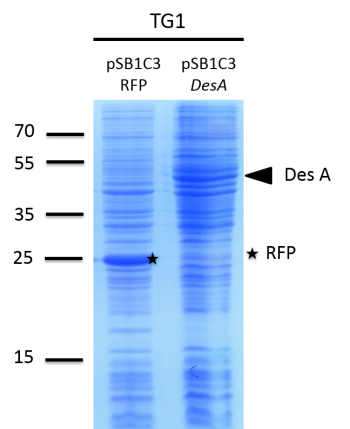 Different backgrounds were analysed : wild type Escherichia coli TG1 strain (yellow column), cadA mutant from Keio bank (blue column), complemented cadA mutant from Keio bank with pdesA (BBa_K1951004) (orange column), complemented cadA mutant from Keio bank with des operon (BBa_K1951011) (grey column).